If you are up for a round of golf amidst the ambiance of a sugarcane plantation then you should try the Canlubang Golf and Country Club. The Canlubang Golf & Country Club is said to be a favourite Golf Club among the local golfers. To them, this is the perfect Golf Club, which makes no pretense of grandeur with the presence of an imposing clubhouse decorated with luxurious settings or posh restaurants. Rather the allure of this Golf Club is the fact that you can come here to enjoy the Gentlemen’s game of golf without the protocols of the Crème de la Crème. In this respect, there is no equal to the Canlubang Golf & Country Club. 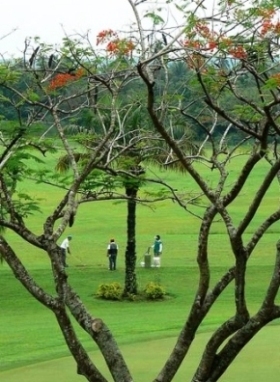 The Canlubang Golf and Country Club is said to be the largest golf course in the Philippines. The Golf Club features two 18 hole golf courses, The North Course and The South Course both designed by Robert Trent Jones. Jr. Between the two courses, the Par 72 North course measuring 6872 yards is the longest. 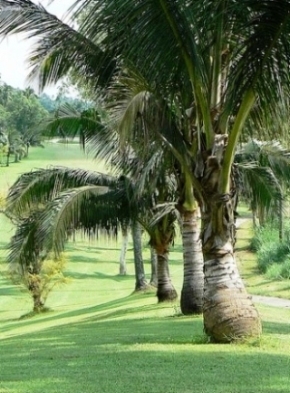 Resting in a former sugarcane plantation, the course features undulating fairways set among the coconut palm trees. The first thing that will captivate you when you see the grounds, is the sheer size of the courses. By the scale of things, the fairways, the landing areas and the greens are just HUGE! The North course is also unique as the 9th and 18th signature holes have adjacent greens. The fairways are also splendidly laid out among the ravines and man-made lakes. Another challenge, which golfers will face playing here, is the wind. In addition, the short Par 3s traverse over huge ravines! Together with all these factors coming into play, any golfers who play the North course will definitely have a thrilling and fulfilling game. For the prefect round roundup of your game, you should also try out the sister South Course. The clubhouse at Canlubang Golf and Country Club is modest when you compare it to the other championship golf courses around the country. Still you have a driving range, practice putting greens, a bar, a pro shop, restaurants, gents & ladies locker rooms and tee houses to service all those who are playing here. Tourists are only allowed to play here during the weekdays. As this is a private club, prior arrangements have to be made for those unaccompanied guests who want to play a round of golf here. 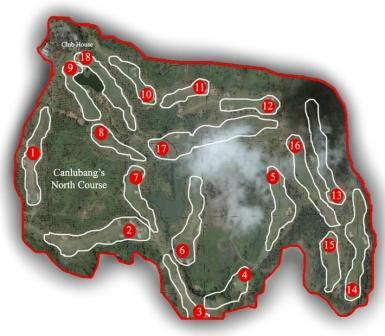 Where is the canlubang Golf Course? The Canlubang Golf and Country Club is about a 55 minute drive from Makati. To get to the Club, you will need to use the South Luzon Expressway and exit at Silangan. Then, take a right turn and keep on the same road after passing the checkpoint. Be sure to stay to the right. Make a right turn when the road ends. At the Caltex Gasoline Station, take a right and follow the road until you see the Club on your left. Do note that private transportation or car rental is the only way to get to the Club.